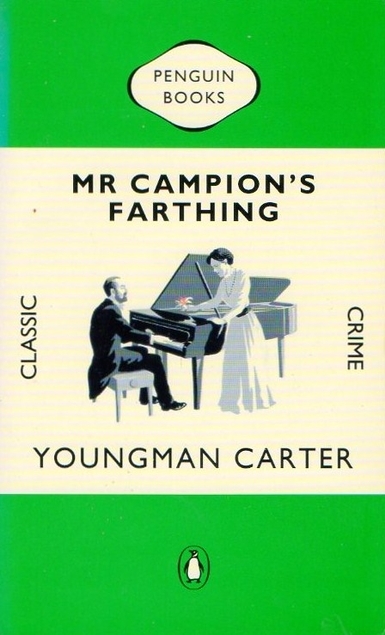 Mr Campion’s Farthing by Youngman Carter was published in 1969, three years after his wife Margery Allingham’s death. He had completed her unfinished book Cargo of Eagles and decided to write more books featuring Albert Campion, but he only wrote two before his own death. 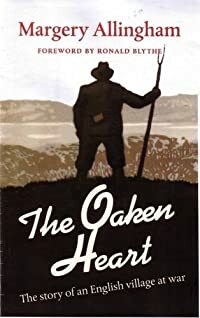 Apparently he had always helped out with the plots of Allingham’s books, I can easily believe that as this book is certainly not close to being the worst I’ve read. It’s very much of its time, featuring Russians and an attempt by one of the characters to defect during a trip to London. That sort of thing often seemed to be happening in the 1960s and 70s as I recall – back in the ‘good old days’! Anyway – this book is fairly well written although a bit bizarre in parts, but it would have been better if Campion hadn’t been involved at all. He’s obviously used as a means of obtaining more sales. In this book though Campion has reverted to being the young Campion of the early days before he matured and actually developed a personality. It’s not enough just to describe a character as having large horn-rimmed spectacles, and more or less leave it at that. I’ll probably give this one a 3 on Goodreads but 2.5 would be nearer the mark. Margery Allingham was asked by some American friends to write about the experiences of life in her Essex village during the run up to the outbreak of war – and the next couple of years. I’ve been wanting to get my hands on a copy of this one for some years and at last I gave up hope of finding it in a secondhand bookshop and resorted to the internet. I was particularly interested in this one because for a couple of years I lived in Essex, in Braintree which is a town just 15 miles from Tolleshunt-Darcy where Allingham lived. Of course due to the need for secrecy the village was given a different name – she chose to call it Auburn after a village in an Oliver Goldsmith poem. She makes it clear that the locals have a certain character, they would possibly be seen as being a bit odd compared with people elsewhere in England as the East Anglians are a bit of a breed apart, but when you get down to it where the war is concerned they behave much the same as the rest of Britain. Although that ‘eastern’ character is recognisable in the whole of the east coast of the UK I think. I was quite surprised by how naive they seemed to be though – regarding Neville Chamberlain’s negotiations with Hitler. They gave him a lot of credit and placed great trust in him, so when the inevitable happened and we ended up at war with Germany AGAIN – they were truly shocked. This misplaced trust was almost certainly because the village had suffered badly from the loss of a generation of young men in World War I. They probably just couldn’t bear the thought of it all happening again, and that the death of those youngsters had been for nothing. In fact there were hardly any children in the village for that reason. When Churchill took over they all sighed with relief and Allingham judged his character perfectly I think. For some reason the villagers all had great faith that mainland European countries would be able to see the Nazis off, particularly the French. I cannot fathom why they thought the French would be great fighters. Auburn went from being a sleepy rural idyll to a place of constant night time noise as hundreds of Nazi bombers flew overhead under cover of darkness, on their way to nearby London. Inevitably bombs began to fall on Auburn and the surrounding towns, Allingham’s husband joined up to do his bit and she eventually had to take over from the war work that he had been doing locally. One thing that really struck me was her description of watching a formation of 75 Junkers bombers flying overhead and noticing that there were two tiny things like white lice threading there way across and up and down in the formation, like a sewing machine – then she realised that those white specks were the RAF doing their thing. Eventually the bombers gave up and turned back towards France again. Reading that it made me realise just how plucky the young men (hardly more than boys really) of the RAF had been. 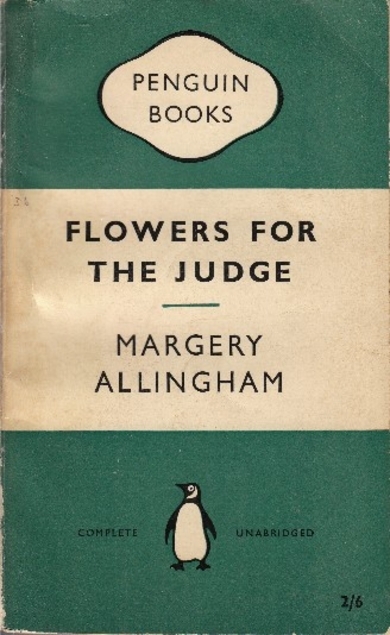 Sometimes the more you know about authors the less you like them but Margery Allingham comes across as being a really likeable person (on a par with John Steinbeck for me). She really avoids party politics although she does say that the village is true blue, but if that is meant to mean Conservative then their behaviour is the opposite of the Conservative party of today as they have become progressively more nasty with every decade since the war. My Conservative voting father wouldn’t recognise that party today and certainly wouldn’t vote for them. To lots of people the word socialism is a dirty word, even evil, but Margery Allingham describes socialism as being like Christianity without the religion. That’s perfect as far as I’m concerned. Towards the end of the book she writes about her personal thoughts on life, class and politics. Her attitudes are definitely those of middle England, too class ridden for my Scottish sensibilities as we are more inclined to take people as they actually are – not because of their status in society. This is what attracted Queen Victoria and Prince Albert to Scotland and the Scots. It’s a more healthy way of looking at society as it avoids that bizarre ‘respect the uniform/status’ nonsense which is a danger to society. As we say in Scotland, ‘we’re all Jock Tamson’s bairns‘ which means that when you get down to it – be we queen or pauper we’re all human beings. Although as the Scots were very popular with the Auburn villagers and Margery Allingham, particularly the Scottish regiment that camped out in the village for a while, I can’t help feeling just a wee bit – no not quite superior about it, but certainly happy! Phew. That was a ramble and a half, anyway, if you’re at all interested in the social history and the run up to the start of World War 2 and on until 1941 when the book was first published you’ll find this book really interesting. 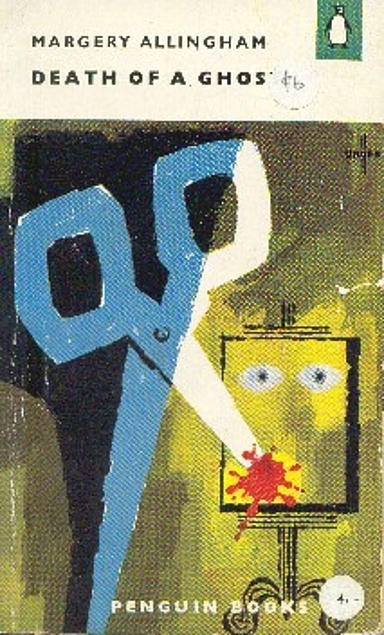 Traitor’s Purse by Margery Allingham which is called in the US – The Sabotage Murder Mystery – was first published in 1941. After reading an article in the Guardian recently about the book I decided I had to read it soon, so I resorted to the internet to get it fast, rather than doing my usual patient mooching in secondhand bookshops and trusting to serendipity that it would turn up soon. Prior to reading the Guardian article I had always read that Allingham’s best book was The Tiger in the Smoke, so I was very surprised when Traitor’s Purse was mentioned as being so good, but I must say that I agree completely, especially as the book cleared up a puzzle for me. 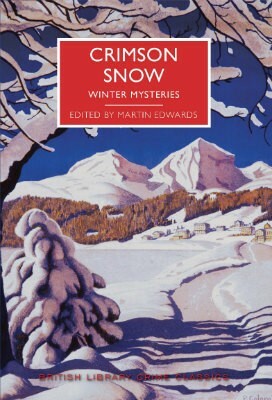 I had always been perplexed by the character of Allingham’s sleuth, Albert Campion. I haven’t been reading her books in order and it seemed obvious to me that the older Campion had matured into a much more interesting human being. To put it bluntly the young Campion always seemed to me to be more than a bit of a wet willie. In Traitor’s Purse Campion has more or less the same opinion of himself as I had. Campion wakes up in a hospital bed, unable to remember anything, not even his own name. He overhears a conversation which implies that he is a murderer and will be hanged, so he wastes no time and escapes from the hospital. Outside he bumps into Amanda and some other people who have no idea that he has lost his memory, but they seem to expect Campion to be in charge. There’s an important thing which they expect him to do, but Campion is clueless as to what it is. When he catches sight of himself in a mirror he’s surprised by how old he looks as he seems at least ten years older than he thought he was. (Which of us hasn’t had that experience!) But worst of all is that he has assumed that Amanada is his wife, so it’s a horrible shock when he discovers that he is only engaged to her and he has been engaged to her for 8 years. What sort of man is he he wonders? Who would leave Amanda dangling like that all that time? He doesn’t like the personality which seems to be his. It’s all very well being a gentleman but it doesn’t have to be combined with stupidity. I thoroughly enjoyed this one and I’m presuming that Allingham realised that she needed to make Campion a much stronger character than she had made him before. He needed a knock on the head to give him a different outlook on life, and that’s exactly what she gave him. Written at the beginning of the war and at a time when things weren’t exactly going well for the allies this is more of a spy thriller than a murder mystery and fittingly John Le Carre was an admirer of her writing. You can read the Guardian article about Allingham and Traitor’s Purse here.